Su Weilie – Architect/Interior Designer/Representative is a Guangzhou native who studied Construction Engineering at Hunan Institute of Technology and Architecture, and City Planning at Wuhan University of Technology. In 1990 he joined the Panyu Bridge Group Company and participated in the design of Nansha Port and Nansha Tian Hou Temple restoration project .In 1994 he founded Guangzhou Red Leaves Decoration Project Co. Ltd., and participated in assignments for the Guangzhou Olympic Garden. 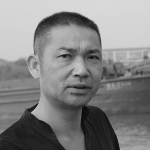 In 2004 he moved to the Conghua Mountains for self-cultivation and a contemplative education, and to research Agrarianism and the ancient practice of Daoism. Returning to Guangzhou, he participated in the Guangzhou Natural Park development as well construction projects focused on Luxury Hotels, Office Buildings and Refurbishing Historical Buildings.